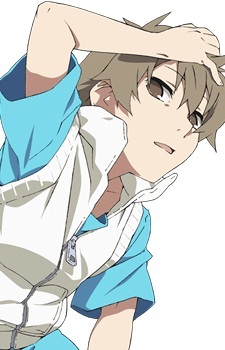 Hibiya is a young boy with short light brown hair and brown eyes. He wears a white vest with a hood over a blue shirt. He also wears brown shorts and black sandals. First appeared in Heat-Haze Days. A boy that visits the city to take summer courses with Hiyori. He is known to be very mature for his age, yet has a cheeky personality. His quarrels with Momo are endless. On August 15, he becomes involved in a certain incident with Hiyori. He is the only one saved by Konoha, and is possessed by the Focusing Eyes snake under these circumstances. It has the power to perceive objects and details that are far away from an aerial view. After escaping the time loop and joining the Mekakushi Dan, Hibiya fell into a deep depression over the loss of his love, Hiyori. Momo managed to pull him out of his depression after considerable effort on her part.